This coffee will be fresh roasted for you. 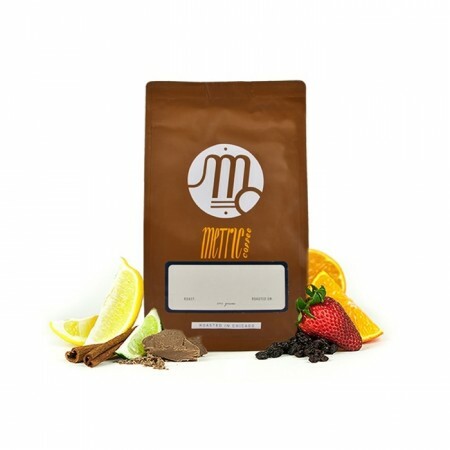 We expect Metric Coffee Co. will roast and ship this coffee in 1-2 business days depending on their roasting schedule. This is the Sugar Tooth Seasonal Blend brought to you by Metric Coffee Co. This is a seasonal offering from Metric to highlight fresh crop coffees in unique combination of flavors that represents a sweet and round flavor profile. It is comprised of coffee sourced from Kenya and Ethiopia at altitudes that range from 1,300 - 2,100 meters. This cup is fantastically balanced and round, with notes peach ring, lemon bar, and green apple. Didn't care for it at first but it grows on ya. Too sweet, bland in coffee flavor. Not a favorite. This was nice. Not my favorite Metric. Yummy. While a little more acidic that I am used to, this coffee has an amazing sweet flavor to it. Since it is seasonal, I need to remember to order it again next year. My pallet must not be sensitive enough to detect the "sweet" flavors this coffee promises. It tastes like an average blend of coffee. I don't hate it, but it's not something I'd try again. This is great! Love the citrus notes; present but not overbearing. I appreciated the initial tang, and caramel notes, but I didn't like the raisin finish. *Updated rating since receiving second coffee. sweet and delicious, but not too sweet. The beans smelled amazing. As brewed it was really good. It tasted better when I brewed it a little weaker than normal. I like the sweetness in the beginning followed up with a citrusy aftertaste. It's like eating a sugar crusted grapefruit. One of my favs so far! Nutty, caramel, smooth with a little bit of berry flavor. Great morning cup. Solid coffee for sure. Love the caramel but I will say I think I am missing the floral fruity element. Also, the citris was a little to much for my pallet. Less complex in flavor profile than last coffee, though very smooth. We ended up liking the first one better. I'm really enjoying this coffee! I like the high volume of caffeine, I will say the flavor is pretty light, almost too light, but when I let it steep longer while brewing I'm able to get more flavor. A bit too light for us, but not a bad coffee overall. One of the most well-balanced coffees I have had yet. Very subtle citrus blends well with caramel notes. This is our favorite so far! Love the deep flavor that's brightened up by the fruity/citrus acidity. I liked it at first. It did not sit well with my wife though. Very smooth - enjoyed the rounded out flavor profile. Pretty good, but not our favorite. It had almost a savory bite at the end. The caramel flavor was great! Great Medium body coffee!! A great daily drinking coffee with a pleasant finish. Bit of chocolate and roasted nutiness in the flavor. Really enjoyable. Solid cup of coffee but nothing spectacular. This one was good but Cleavon Little still my fave!